It was last Thursday when Boston Breakers’ management called Cat Whitehill into a meeting to gauge her interest in being the team’s head coach for the final four games of the season. Whether or not Whitehill said yes, a decision had been made that Lisa Cole would be let go the next day after nearly five years with the organization. Whitehill, though, said yes. Somewhat surprisingly the news never leaked to the public until the Breakers finally put out a press release in the 6 p.m. hour. 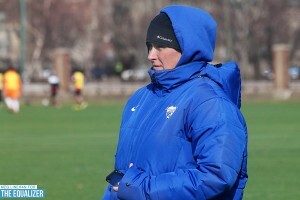 The team was exiting a five-goal performance in a victory over the Washington Spirit and at the time of the release was less than 24 hours from hosting the Western New York Flash. There had been no mid-week match. It was an odd time to fire a coach, and the timing spawned speculation that something happened late in the week to trigger the decision. The Breakers were 6-7-5 this season under Cole (6-7-6 now), who was with the team since 2009 and was elevated to head coach in 2012. This season represented a new beginning, though. The club began the calendar year 2013 with no players. Cole, who said she is still trying to wrap her head around getting fired, shouldered her share of responsibility for the season falling well short of expectations. Cole said some of what held the team back was player decisions, but did not expand. The team was in the spotlight earlier this year for struggling to fill the goalkeeper position after their allocated keeper was 18-year-old Cecilia Santiago. They wound up convincing Ashley Phillips to play and eventually landed Alyssa Naeher. But they also struggled to find experienced outside backs and wound up often switching with different personnel among the back four and goalkeeper. Whitehill did add that injuries and national team call-ups were mostly responsible for the inconsistent defensive lineup and that Cole was not to blame. The Breakers have also lacked midfield mobility and at times struggled to stretch the field wide. They showed improvement in this area July 6 at Sky Blue, when Cole pulled Mariah Nogueira out of the starting lineup and used Joanna Lohman as the lone holding mid. It resulted in a more crisp buildup. Whitehill employed a similar formation Saturday against the Flash and it nearly resulted in a win if not for two Flash strikes inside the last quarter hour. Back in Friday’s team meeting, Whitehill attempted to give the players as much opportunity to ask her questions as Stoller and Billiard had given her. The club needs at least seven points from its last three matches and a bunch of help on top of that to sneak into the playoffs. “We’re not totally out yet,” Whitehill said. It seems, though, that the coaching change was geared toward setting a new course looking ahead to 2014. Billiard added that the club has already “been bombarded” with inquiries about the position and that they have come from a wide range of soccer backgrounds. Whitehill said she would like to explore coaching down the road but that she is not done playing and has no interest in full-time double duty. Billiard said Lilly is not currently a candidate but he did not entirely rule out the concept. 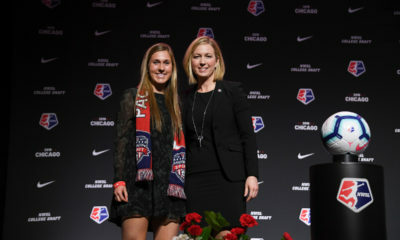 As for Cole, she dismissed any notion that it would be bittersweet following the rest of the NWSL season. She will soon begin looking for her next coaching job, wherever it may wind up. 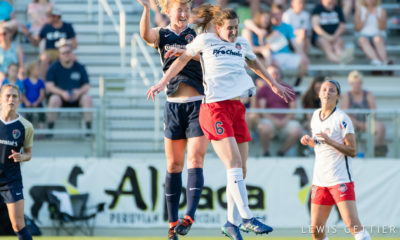 Needing a draw to secure a playoff spot FC Kansas City disappointed a league-record crowd in Portland on Sunday for a 3-2 win that puts them in the playoffs as well as the driver’s seat to win the regular season. One more win secures the Blues a home playoff match and any combination of five point either gained or dropped by the Thorns clinch first place. Oh and they have not lost since June 16. Sunday’s match attracted a league-record 17,619 to JELD-WEN but the Thorns were unable to provide the dream ending, falling 3-2 to lose control of ending the season on top of the league. They will now need FC Kansas City to trip up elsewhere and the focus will turn to outpointing Sky Blue over the last two weeks in order to host a semifinal. The Thorns have a match in hand but do not play at JELD-WEN again. The outcome of their season could ride on which way Alex Morgan goes. Will she be the frustrated youngster who took frivolous yellow cards in consecutive matches? Or the unstoppable force who willed the Thorns second goal to keep Sunday’s match in doubt until the end? One more point—or point dropped by the Red Stars—and they’re in the playoffs. It was only the Spirit, but the 1-0 win for this banged up side was a much-needed confidence booster, and they can clinch a playoff with a draw Sunday in Chicago. In fact they could clinch with their feet up on Wednesday if the Red Stars do not beat Washington on the road. In terms of getting to 2nd it looks bleak with the Thorns holding a game in hand and the tiebreaker, but consider this: Sky Blue has an easier schedule, and the Thorns will have to lose once to give Sky Blue a chance. If they do it will cost them at least one goal in the goal differential category that currently separates the teams by just two goals. All things equal, Sky Blue would probably rather get healthy and go on the road for the semis. 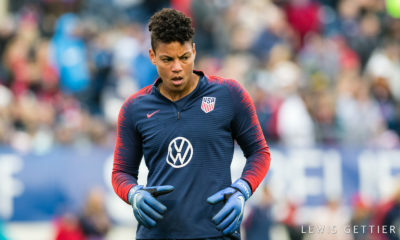 After 17 matches with the same starting keeper and back four, an injury to Brittany Taylor forced a change on Wednesday and another to Alex Sahlen during that match forced another on the weekend when Taylor returned. It hardly mattered Wednesday as the Spirit rarely made the Flash defend anything in their own half, but Saturday they had to pull out of a 2-0 hole to earn a late draw in Boston. Now they’re back home for the last three and trying to put the finishing touches on a playoff berth. A win Wednesday combined with a non-win by the Red Stars gets it done. The Flash won’t have to play outside Sahlen’s Stadium again in the regular season and can still finish as high as first if they win out and get plenty of help. Nine days after getting routed in Seattle, the never-say-die Red Stars returned the favor in front of a full house at Benedictine University Sports Complex. It kept them within shouting distance of the Flash, who were held to a draw on the weekend, but they are still five points adrift with no reasonable chance of making up the goal difference tiebreaker. A .500 or better finish would be quite an accomplishment for a team that has taken personnel hits from allocation right through the final weeks of the season. Leading 2-0 with 15 minutes to go, the Breakers were on the verge of beating the Flash in Cat Whitehill’s coaching debut Saturday night. The result would have made things interesting this week. And then the Flash scored twice to tie, relegating the Breakers to life support. Now they can win both matches this week—no easy task against the Thorns and Blues—and still be eliminated if the Flash win either of their matches. The Reign were already knocked out of the playoff race by the time they finished losing to the Red Stars on Saturday, an inevitability extended several weeks by the team’s second half surge. Laura Harvey has successfully laid the groundwork for what future Reign teams ought to look like and they figure to be one of the more intriguing sides heading into 2014. 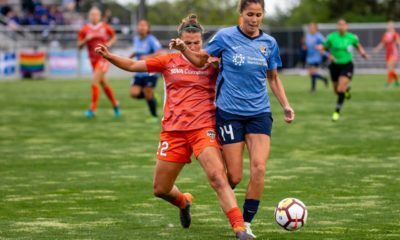 The losing streak reached seven and the unbeaten streak to a baker’s dozen following a blowout loss in Western New York and a hard-fought loss at Sky Blue. The losses conspired to clinch the bottom of the table for the Spirit. Worse, injury after injury has prevented the staff from gleaning any sort of look at what a successful team might look like going forward. Where are the goals coming from? — Sahlen wound up missing the weekend with a foot strain and has been ruled out for Wednesday against the Reign. — U.S. national team head coach Tom Sermanni was a guest in the FOX Soccer booth on Sunday and it sure sounded like Leigh Ann Robinson is on the cusp of a call-up. — Danielle Foxhoven’s post-match comments Sunday are worth a listen. Are some of the Thorns players less invested than others? — The Washington Spirit have clinched 8th place in the 8-team NWSL. Unless an expansion team is granted the 1st pick in the draft, the Spirit will hold that pick. — There has been great speculation about what will happen if a team winds up with more than three allocated U.S. players. While the league has yet to formalize off-season mechanics, one thing that appears to be off the table is reshuffling the deck and forcing a team to give up a player just because one of the federations decides to subsidize different players. Instead there is likely to be other compensation. 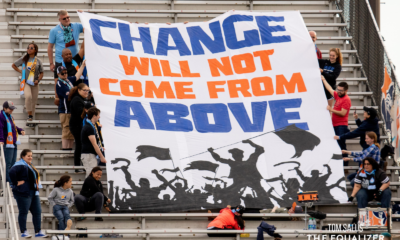 — Several groups remain interested in joining NWSL but momentum is also growing to put off expanding until 2015. Stay tuned as any new team will want ample time to ramp up to next season. We should know for sure by the end of September. — Red Bull have confirmed they are in talks—not negotiation—regarding the future of Sky Blue and the possibility of the club playing at Red Bull Arena. See the full statement here. — Lauren Holiday scored twice Sunday to move into the league lead with 12 goals. That’s two more than Abby Wambach and Sydney Leroux. Holiday also leads the league with nine assists. — Sky Blue expect Danesha Adams to be available for Sunday’s game in Chicago. — The Breakers have reported a sellout for Wednesday’s home match against the Thorns. At last check there were standing room ticket available for purchase at the gate. — Alex Morgan and Tobin Heath are both sitting on four yellow cards and will be suspended for one match if they get booked again the rest of the season. Morgan came perilously close to the dubious distinction Sunday against Kansas City but was spared. The only other two players in the league on four are Kaylyn Kyle and Jessica Fishlock from Seattle and Carli Lloyd from Western New York. — Finally, the U.S. women captured their third consecutive Deaflympic gold medal with a 2-1 victory over Russia on Sunday in Bulgaria. Check out the full match report here. 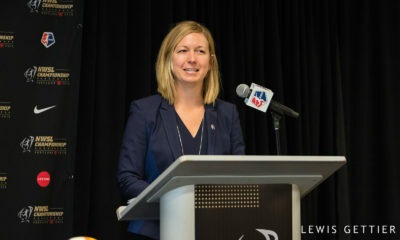 In 2018, where does the NWSL fit in the larger sports landscape?